Lapins is a large dark red juicy cherry with a mild sweet/sharp flavour, and will appeal to those who like cherries but prefer a milder flavour. 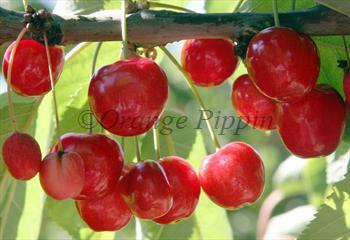 It is one of the best cherry varieties for the UK garden, heavy cropping, quite vigorous, and easy to grow. Lapins is self-fertile and can be considered an improved Stella (which is one of its parents). It is well-regarded by commercial growers because it crops reliably and the fruit is large and of good quality. 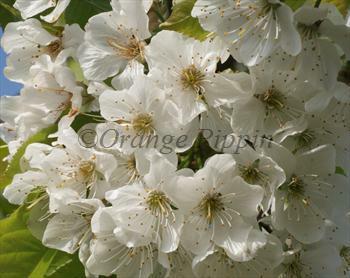 Please fill in the details below and we will let you know when Lapins cherry trees are back in stock. A self-fertile white-fleshed cherry with an excellent flavour - a good alternative to Lapins. Lapins is in flowering group 2. Lapins is self-fertile and does not need a pollination partner, although fruiting may be improved if there is a compatible tree of a different variety nearby. Lapins is one of the modern self-fertile cherries developed in Canada, and a very good pollinator for other varieties if they flower at the same time. It is one of the heavier-cropping cherries, and comes into bearing at an early age - therefore a good choice if you want a large cherry tree on the Colt rootstock. It grows with a characteristic habit - noticeably more upright than the spreading form of most cherries. Lapins responds well to fruit thinning and/or measures to encourage growth and leaf production. This improves fruit quality and fruit size. Lapins requires very little winter chilling hours and is therefore a good variety for warmer climates. For UK growers, the main requirement is to make sure it is planted in a sheltered spot in full sun. Lapins was developed by Dr. Charles Lapins of the Summerland research station in British Columbia, Canada during the 1960s and 1970s, and released in 1984. It is sometimes known as Cherokee. It was developed from Van x Stella, in the same breeding programme that also led to Sunburst (also Van x Stella).